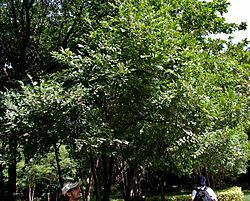 Diospyros is a genus of about 450–500 species of deciduous and evergreen trees. Most are native to the tropics, with only a few species extending into temperate regions. They are commonly known as ebony or persimmon trees. The generic name is derived from the Greek words διός (dios), meaning "of Zeus" and πυρός (pyros), meaning "grain" and was originally applied to the Caucasian Persimmon (D. lotus). Diospyros Facts for Kids. Kiddle Encyclopedia.